The above image is from a box of toy soldiers by Italeri. 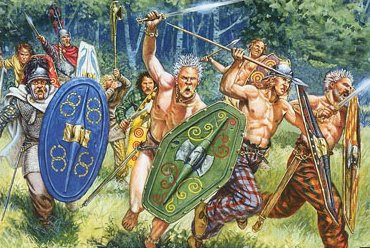 Classical writers were fond of characterizing the Celts as un-civilized barbarians. The Greeks and Romans derided the Celts’ violent behavior, yet their own societies encouraged this warrior society. Slaves and mercenaries were in high demand in the Mediteranean. In response to such a market, the neighboring Celts placed emphasis on fighting abilitiy—to captures slaves for trade and to offer skilled fighters for hire. War was a large part of their society, but they were not simple brutes. yet They were also superb craftsmen, with a developed market economy. Although they shared a similar culture and language, the varied Celtic people never formed a single unified nation. Indeed, many historians now are reluctant to use the term “celt”, because it implies a false homogeny. Romans were impressed by Celtic prowess in battle and were eager to employed them (especially the cavalry) in the Roman army. Roman territory had long been subject to raids by various Celtic tribes. The conquering and "Romanizing" of Gaul and Britain reduced the threat to Roman interests. However, raids from the remaining free Celtic lands and rebellions from within would continue. The ancient Celts were fond of bright colors. Their trousers, capes and tunics were dyed with stripes, plaids and other patterns. Some of the more fanatical warriors were reported to have fought completey naked. See my article on Celtic Clothing. Armor - The Celts were among the first people to develop chainmail. They may have invented it. This excellent body armor was typically reserved for the wealthy Celtic nobles, but it was not too uncommmon for the rank and file men to wear a bronze or ironhelmet. Based on the number of Iron Age helmets found on the continent vs. Britain, it would seem that helmets among the British were less common than with the Gauls. Celtic warbands were composed of several general catagories of specialized warriors. Command - carried large shield, heavily armored warlords. Battle commands were relayed by standard bearers and horn players. 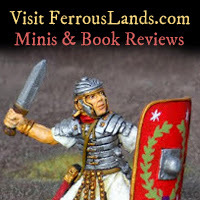 Heavy Infantry - large shield, spearmen and swordsmen. Cavalry - elite warriors, armed similarly to heavy infantry. Chariots - uncommon on mainland Europe by 1st century BC, continued in Braitian. The battle tactics of the Celtic tribes must have varied somewhat from region to region. Caesar's writings of his war with the Gauls indicate the celts could be quite capable of sophisticated miliatry tactics and formations. Captured celtic equipment sculpted on Roman monuments implies the celts fought in an organized fashion. For instance, the Arch of Orange depicts celtic trumpets, military standards and flags. These are all items used in conveying commands and maintaining organization on the battlefield. Ancient writers such as Polybius stated that the celts were unruly warriors, lacking planning or control. However, it seems this characterization was fabricated only to present the Romans as superior.